In a few weeks, school starts again. This is the best time to begin connecting with students and getting them to connect with their peers. Try something new this year! Get students to talk about themselves by presenting selfies they have taken as part of a mission you have sent them on. First, get students to watch the video, Around the World in 360° Degrees, and reflect on it. Then show students the first slideshow below with selfie missions to get them meeting other students, exploring their surroundings, and reflecting on their learning goals. Feel free to use my missions or if you have time create your own presentation and introduce yourself to your students. The second slideshow is an adaptable PowerPoint template that you may download and have your students use to upload their selfies. Another option is to upload this template to Google Slides. This template has preset slide timings of 20 seconds. 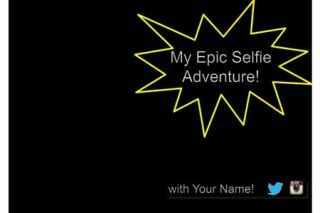 The idea is to get students to share their completed selfie missions as a Pecha Kucha (6 minute, 40 second presentation) or Ignite presentation (5 minute presentation). You can have them present to the class or in small groups. I have listed the missions below, but feel free to give them any mission you want. Selfies are an important part of your students’ digital identities. Their selfies help them humanize their digital experience. When students post selfies on social networks they get immediate reactions from their peers. Selfies impact a student’s self-concept and self-esteem. Students adapt their selfies to receive certain reactions. We can get our students to transform their selfies into meaningful adventures with them at the center stepping out of their comfort zones and exploring the world around them. Discover many more digital activities like this one by attending my free webinar on Friday, July 31st, Meme Me! The Student’s Concept of Self in a Digital World. Enjoyed these ideas? Get your copy of The 30 Goals for Teachers or my ebook, Learning to Go. Tip: Taking selfies is much easier with a selfie stick. You can find them as cheap as $5. Tip: Press the time delay in your camera settings to give you 3 or more seconds to prepare for your selfie. Tip: Try the CamMe app, which lets you take photos using hand gestures. Other great selfie apps include TouchCast (make a video selfie), Aviary, Pixlr, PicsArt, BeFunky, Pic-Collage, Image Chef, Looksery, Selfit, and Group Shot. Remember to get parent permission to post student images and also get students to receive permission from their peers to share their photos.